Shaw’s ever-growing collection “of everything Holmesian”, as he often said, was a magnet for Sherlockian scholars around the world; and it all resided at “A Little Adobe House in Santa Fe, New Mexico,” (an article by Jim Hawkins, published in The Friends of Sherlock Holmes Collections, 2002). Shaw worked religiously at spreading the news of Sherlock Holmes. He advertised his library in newsletters, in personal notes, often mailing as many as 30 letters a week, by phoning book sellers and other Sherlock Holmes devotees searching for rare books, and by hosting meetings of the following events. Steve Robinson with a unique item in the Shaw Library, (1991). As John’s fame grew, Sherlockians from far and near began making the pilgrimage to 1917 Fort Union Drive to meet THE John Bennett Shaw and spend hours looking through the treasures in the library, sometimes called the “slumber room” because many a visitor spent the night on the couch there. They enjoyed swapping stories about collecting books and Sherlock Holmes keepsakes. John seemingly had an interesting story about every volume and item in the room. Visitors ranged from noted scholars to members of various scions across the country. Steve Robinson (pictured right, May 25th, 1991) brought Denver Sherlockians Greg Ewan and John Stephenson to visit Shaw at his home in Santa Fe. Robinson recently searched through his John Shaw treasures and came up with the most incredible 8-mm video of their visit in 1991. He then had the video transferred to digital and posted it at the Friends of John Bennett Shaw, but we hope to post an edited version of it here soon. Shaw faking embarrassment on the number of volumes in the library in 1991. Image of Shaw taken from Steve Robinson’s 8-mm video from a 1991 visit to Santa Fe. Employing his librarian background skills, Shaw spent countless hours labeling and cataloguing his collection, and we repeat, without the convenience of a computer; it was all done by hand. He did, however, have hundreds of file boxes and ring binders, and he took time to carefully label and decorate each one. Like many Sherlockians he enjoyed seeing a graphic representation of what was inside the container; obviously he had thousands of illustrations to choose from. The box I have was manufactured by The Magafile Co. in St. Louis, MO, size 5 D. It came as a flat and had to be folded into a box. Shaw had a countless number of these. After his collection was safely placed in the John Shaw Library at the University of Minnesota, dedicated as such in 1995, the library made those file boxes available to interested Sherlockians for the asking. Brad Keefauver was kind enough to gift me with one of those. It was one of the sparks igniting my desire to share John Shaw’s story at this website. Jon Lellenberg (BSI - 1974) was a visitor to the Shaws’ home in 1973 and spent the night sleeping on the sofa in the library, “assuming we could get to sleep with so much Sherlockiana around us on the shelves,” he added. 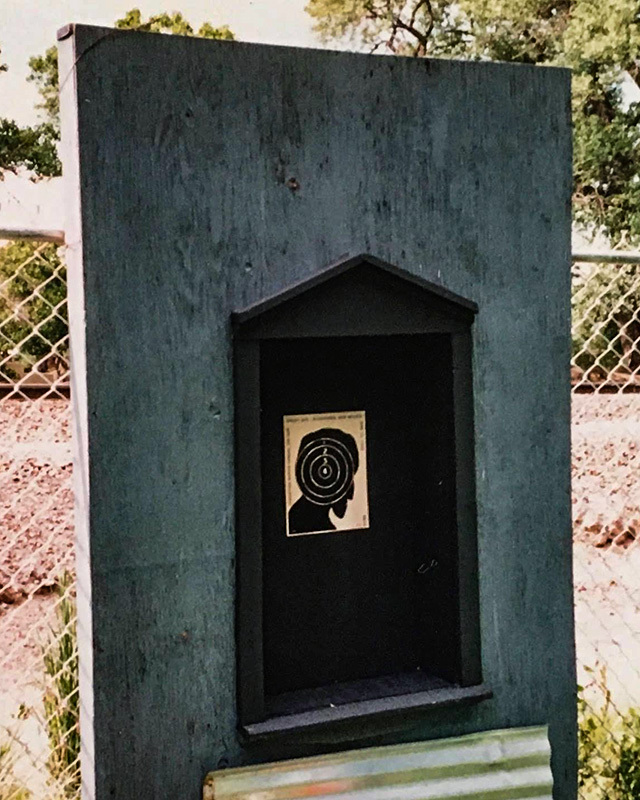 He sent a remembrance of the Trap Shoot he attended in Santa Fe during his visit. Ron Lies’ target, with no hits or bullet holes. 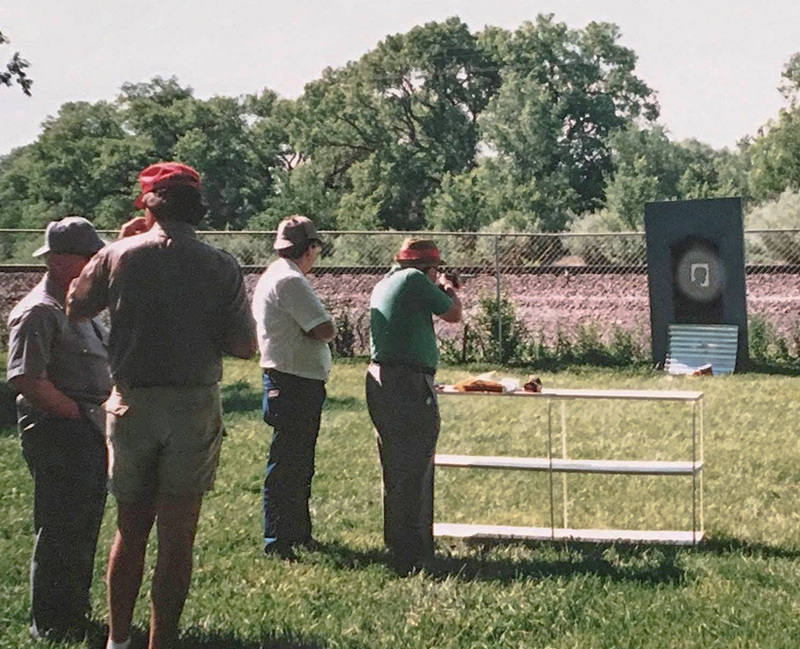 A bit more on the Annual Trap Shoot, always a crowd-pleaser and the very essence of John Shaw’s wacky sense of humor. No doubt he grew up familiar with guns and hunting, as most Oklahoma kids did in the 1920’s and ‘30’s. Shaw came up with a target supposed to be the silhouette of Colonel Sebastian Moran. Ron Lies, my Brother-in-Shaw from Denver, tells a poignant story about his first Trap Shoot that demonstrates the kindheartedness of Shaw. 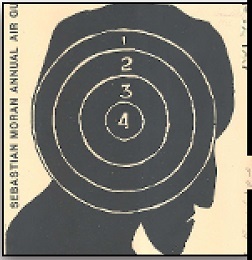 I was participating in The Sebastian Moran Annual Air Gun Shoot Off, arranged by The Brothers Three of Moriarty in June of 1987. Each of us wrote our names on our target sheets, which would be replaced for the next contestant as each one of us shot. The trophy for winning was gigantic, and I wanted to win it or at least make a good showing. My hopes were based on realism, however, and to me a good showing would mean hitting the target at least once. Even that was a remote possibility for a four-eyed squinter with one near-sighted eye and the other far-sighted, causing depth perception problems. It came time for the contestants to take their turns shooting. One at a time, all alone, all eyes on the shooter, we took our turn. When all the contestants completed their shots, the target sheets were collected for judging. As fate sadly decreed, my sheet was the only one with no holes or hits on it. I was getting a large share of ribbing from the other shooters. John Bennett Shaw somehow knew how I felt. The ribbing from these men was good-natured, but having dealt with poor eyesight all my life, it was tough to take. He turned to the other shooters and said, "Boy, you guys do not know a true collector when you see him. Ron did not want to hit anything and ruin his target from the shoot. I taught him well." The ribbing ended immediately. As he tuned to walk back up to the house for lunch, John smiled at me and winked. 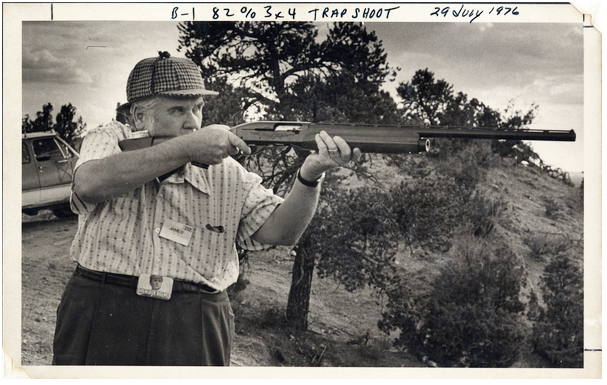 Steve Robinson, owner of Wolf Mountain Books in Flagstaff, AZ, took some great photographs at the Trap Shoot in 1988. In these 26 pages Rice and Brosnan celebrate their friendship with Shaw through recollections of workshops, images from his files, reproductions of his letters and printed materials, famous Shaw quotes, and a quiz on: Thirty of the Cases in the Holmesian Canon Prepared for the Third Annual Colonel Sebastian Moran Trap Shoot Meeting of The Brothers Three of Moriarty, May 23, 1973. Here is a line from Susan Rice’s article entitled “The ‘Hans Sloane’ of Our Age”. ”Collector, Punster, Simpson, Shaw” — Thomas L. Stix, Jr.
Jeff Decker, who knew and worked with John from 1979-1984, has been kind enough to contribute this remembrance. His email arrived recently. My name is Jeff Decker. I live in Pennsylvania now, but during 1979 to 1984 I lived in Phoenix, Arizona, and visited Mr. Shaw's home in Santa Fe. We became fast friends, and I did a number of illustrations/cartoons for John, drawings he used mostly as greeting cards. I also did an illustration for him regarding his massive collection's migration to Minnesota (it was an illustration depicting John leading a line of pack elephants bearing his collection, like Hannibal crossing the Alps. He loved it!). After I moved back to the Northeast, I saw John again when I attended his seminar in Williamsburg in '87, where he introduced me to Tom Stix. Both Tom and John were instrumental in expanding my interest in Sherlock Holmes, and they were very enthusiastic and encouraging about my artwork. I'm pretty sure that most of the art I did for John is now filed away with the rest of his collection at the University in Minnesota. I am in the process of reading your massive blog on John, which was brought to my attention by Charles Prepolec. It's very interesting and well compiled. I was going through some old manila folders this past weekend and discovered I still had the original artwork for the piece I've attached to this email as a jpeg. Of course, I wouldn't part with it now for anything, but I wanted to share it with you. Congratulations on a great job with your report on John Bennett Shaw. He certainly should not be forgotten. I know I'll always remember him. I had to include the cartoon drawn by Mr. Decker for the December 1990 Baker Street Journal dedicated to John Bennett Shaw (vol. 40, no. 4). And you thought you knew all about what happened at the Reichenbach Falls! As I’ve related to Jeff Decker, this one cracks me up!